HENLEY Cricket Club has spent almost £55,000 on improvements. The Brakspear ground, off Matson Drive, has a new driveway which cost £27,000, and the groundsman has £28,000 worth of new maintenance equipment. 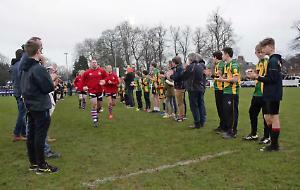 Henley Town Council and South Oxfordshire District Council each provided half the money and on Tuesday representatives of both were shown round the ground as a thank-you. David Winter, the club’s fund-raising and sponsorship chairman, said: “The road is important because it allows better access for people with wheelchairs and pushchairs. “Now the pavilion is used all year round and people were finding it very unpleasant. “We used to spend £3,000 to £5,000 a year filling in gaps on the road and then the beer lorry would come and rip it all up. Groundsman Charlie Jacobsen said the new equipment, including a £16,000 second-hand roller, would mean the quality of the wicket should improve and made parts of his job easier. He said: “It means I can do a more professional job and some of the jobs take less time. Henley Mayor Julian Brookes said: “I’m happy to see the money has been properly spent. Meanwhile, the club will hold its annual golf day on May 11. There will be team and individual awards as well as prizes for longest drive and nearest the pin. The club will hold its annual summer ball on the Henley Royal Regatta lawns on July 15 while the annual sports dinner will be on October 6. All the money raised from the events will go towards paying off the club’s loan on its ground.